The second semester in the first year is spent at Lund University. One of the four courses in this semester is Human Behaviour in Fire. The third assignment of this course was about an evacuation test we did in the buildings of economy. A week before the experiment, we divided ourselves into groups; each of the groups was responsible for a task to achieve before, during and after the test. In the session, we chose the three buildings of economy to make the test in. These buildings are connected by corridors. In the early morning of the test day, we gathered in one of the buildings to prepare everything we had agreed on. Then, we started the experiment by filling one of the corridors with an artificial smoke, then the fire alarm was activated and each group took his assignment to observe how people behave during the drill. Some of us went into classes to see how lecturers and students react when the alarm is activated, others watched the area around the cafeteria. In addition, we blocked one of the exits of the buildings. Also, one of us acted as a disabled person to see how people help each other in emergency situations. The evacuation was quick; it took less than 10 minutes. The number of people at each exit was counted and a prepared survey was handed to all individuals. After that we gathered again to write down all the notes we observed. Then we summarised the results of the survey and wrote everything in a report for the assignment. It was a mixed of fun and benefit as we had the chance to see the theories about human behaviour in real life. Also, these experiments are very useful for the users of the buildings as it makes them familiar with evacuation which makes it smoother in case of any emergency. Promat is a company that has at least one lab test per week. Working in the Research and Development Department lets us attend those lab tests. On Thursday after grabbing the safety equipment to wear during the lab test Andres and I got to the lab. In this experiment, the medium size room was used. People from Promat in Germany came to Belgium, in order to test new different types of cheap fire doors. Unfortunatelly, we were not able to leave the office earlier and see how to prepare all the devices for the lab test. But when we made it to the lab, all the thermocouples and other devices had been put in their positions for the experiment. The two doors, which were going to be tested, had to fulfill the criteria written in the European Norm. The three main criteria are: Stability, Integrity and Insulation. For each one of these, the European Norm describes the way to measure these and also the values that don’t have to be reached. The lab test was supposed to last at least half an hour as the European norm says. But one of the doors started burning after 20 minutes, and as you can imagine, the door did not pass the test. It was quite easy to predict that those doors were not going to pass, but there was a hope to find a cheap door which can fulfill the European criteria. Finding a cheap door within the European criteria could make the company save a lot of money. But this time, a lot of smelly smoke is the only thing that we got from the test. 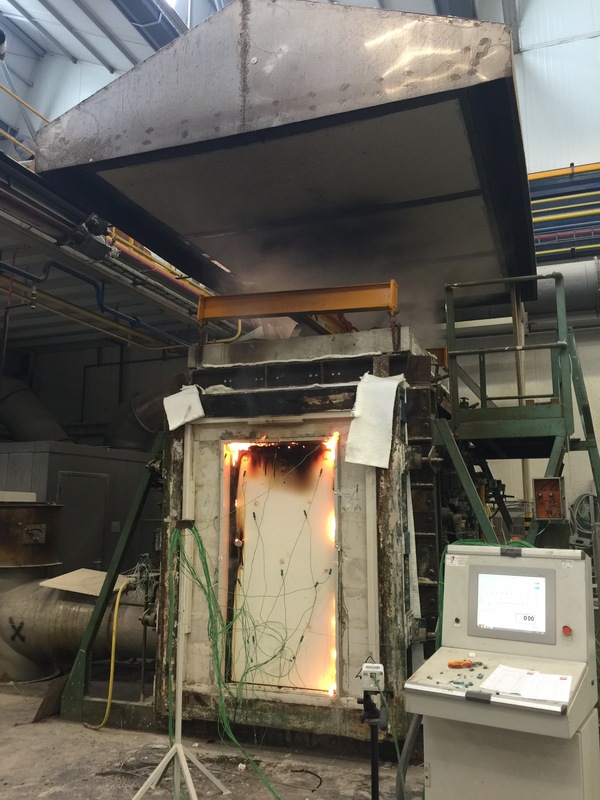 Here is a picture of the door burning during the test.